Ok, first of all, a rat and a mouse is NOT the same. They are two very distinct animals with their own life cycles, habitats and features. What we see in our homes are mostly mice. Mice are smaller, but they are all in a family called rodents. OK, so back to drawing business! 1. Try to get a shape that looks like an egg, by flattening one side of an oval. Let the bigger side sit and the pointed side face top. Now put a tail there. 2. try getting a similar oval again, this time a smaller one, with the flat side attached to the bigger one's top, and the pointed side away from the body. 3. 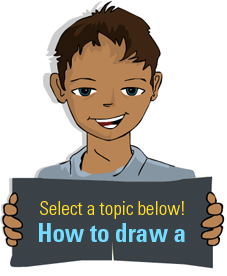 Draw two circles at the top of the body and two smaller circles inside them. Those are the ears, and they do not have to be in any particular size, as long as they are not bigger than the body of the mouse. Now thats beginning to take shape huh? 4. Now throw some colour at it. 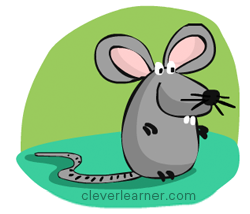 Mice are grey in colour and maybe a pinky inside ear to make it more interesting. Also you can now add a small black circle s the nose. 5. Let's add some background effect to it, and give it some body. We want the mouse to sit so just colour the base of your drawing with any earth colour. Now just add some three lines to each side of the nose as the whiskers. Also notice that I added some little lines to the tail to give it a scaly effect. Try that. 6. Almost there! Now add some two eyes, tiny teeth and just do something on the body to make it the limbs. All these additions are not stuff that you should worry about. Again, art is fun and there is no wrong stuff in art. Just try it. Hope you liked it.